Seems China is one of the worst places to leave your yet to be launched car uncovered. Yet another car has been undressed before its global unveiling – this time it’s the next-generation Chevrolet Cruze, which is rumoured to make its official debut at Auto China 2014 in Beijing towards the end of April. It certainly matches the spyshots that we’ve seen previously. This time, the Chevrolet bowtie goes back to being positioned in the upper grille instead of being in the middle of a bar as with recent Chevy models. The front end is sharper and slimmer now, compared to the outgoing Cruze’s bold nose. We also see daytime running lights installed above the foglamp surround. If you look closely at the rear fender, you’ll see a crease forming a slight pontoon above the rear wheel arch, which gives the Cruze family ties to the current Impala. The tail lamps seen here match the ones we’ve seen in previous spyshots, and although they’re not lit up here, spy photos have revealed that they light up with a U-shape similiar to the Chevy Camaro. We’ve also seen the interior before in spy photos, but since this is not a test mule, the dashboard seen here is a lot cleaner. Like the outgoing car, the new Cruze seems to have a colour-coded interior – this one gets a brown leather wrapped dash to match the leather seats. 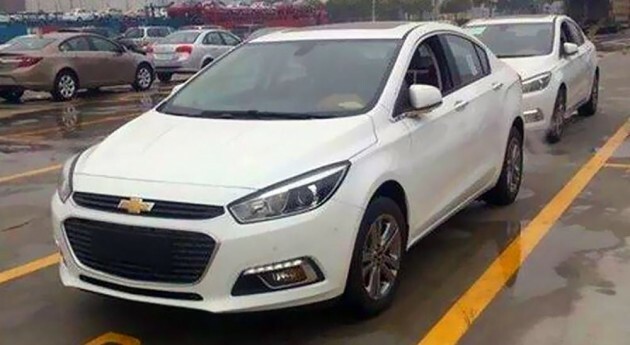 How does this new design compare to the original Cruze, in your opinion? Yuck! 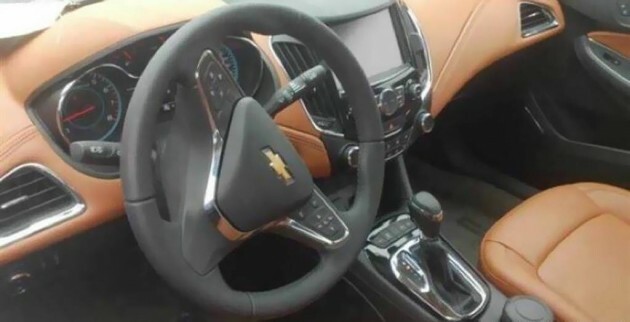 The orange interior looks like old Gen2 dashboard colour. Sure fail like Proton lah this Cruze! They want their Focus back. Ford said go ahead and take our outdated girl, we are happy ripping off Aston Martin now. Is American running out of idea? Will buyers there bored of all “Aston Martin” look in their neighbourhood? Aston Martin every where, after Kia, Ford & Chevrolet this time! Sam Loo, hurry attack its RV! Leather-wrapped dashboard? A feature like that usually only adorns much more expensive cars. The leather used probably not of the finest quality, but still a USP in this segment nonetheless. Chevy simply take the headlamp from New Focus and put on the Cruze? Its very sad to see that their out of idea. Cant they just hire some good designer? They can just design wisely to save cost rather than relocate the batch only to do so. But i must say i’d fall for the interior somehow. Nice color and design there. Looks like Aston Martin -slightly shaken not stirred. Looks fresher than the outgoing model.the down part of it the design is very much like the other competitors.where’s ur identity chevy? As Ford goes all Aston with their products, Chevy steps in with the whole smaall top grill, large lower grill design that we are seeing in far too many cars today, que the USDM Toyotas and also our Vios, ‘pre-Aston Ford’ Ford and Hyundai. In fact if we change the badge, its basically indistinguishable from other manufecturers design. I’ve never been taken-in by the current Cruze especially the front-end. I guess it’s american-centric with its loud bow-tie emblem – it never sold well locally, here. The leather dashboard is cool, i prefer it in black. Nothing groundbreaking with its design. Seems like they are playing it safe by following design trends rather than creating new ones. Looks better than the current one but rather surprised with the generous use of leather on its dashboard. The chrome bits in the dash looks very tacky and would reflect a lot of sunlight when driving in the sun. overall much better than the previous Cruze. the prev one was quite ugly. i think Chevrolet start make good looking car, make good appearance even though have a similarity to others manufacturer. another car that has low resale value and poor sales in Malaysia soon. i thought that cruze going to replaced by Malibu ? With these two americans already here for some time, perhaps Chrysler will jump in with some Italian infused DNA motoring as well. i think chevrolet seriously needs a stronger identity and they need to know actually having strong american influence on their designs is not a bad thing. it can even be beneficial to them.